By: Anna Marie Mazoch, D.D.S. The effect of a missing tooth can be devastating to one’s self esteem. 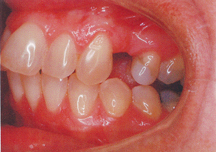 Mrs. E. had to have her upper left premolar removed when she was a teenager. Since that time she had been very self conscious, hated to have her photograph taken and, on the rare occasion when she smiled broadly and was laughing, she would cover her mouth with her hand. 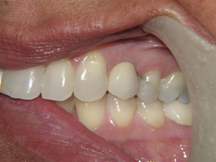 Recently, at the age of 40, she decided to replace the missing tooth. (wires hold the appliance in place and it comes off and on), a fixed, permanent bridge (crowning the teeth on either side of the space with a false tooth attached and cementing into place), or an implant and crown (titanium post which anchors to the bone like a tooth root with a crown attached). Mrs. E.’s wise choice was an implant and crown. In her after photograph you can see how the new tooth crown has blended with her other teeth. She is eagerly looking forward to her next step, to crown the unsightly tooth immediately behind the new implant. Perhaps you would also benefit from a dental implant. Just give us a call and we’ll take care of you. “I can remember sitting in the dental chair, being told that I needed a crown or an extraction when I was 15 years old. At the time, the crown was too expensive for my parents, who were divorcing, and not in a position to pay for any “unnecessary ” expenses. So extraction it was and I have regretted it ever since! If I had known then about the years of self-consciousness, insecurity, camera shyness, and my thoughts that my smile looked like an old lady’s, (my grandmother had the same tooth missing), I would have done whatever it took to save that tooth. Since then, none of my other dentists ever talked to me about replacement options. It wasn’t until I met Dr. Mazoch that I knew what to do. She simply asked, “Have you ever thought about tooth replacement? You’d be a great candidate for an implant crown.” I love my smile now and have gained so much confidence that, whenever my picture is taken, I spread my mouth open wide and let my full smile shine. P.S. 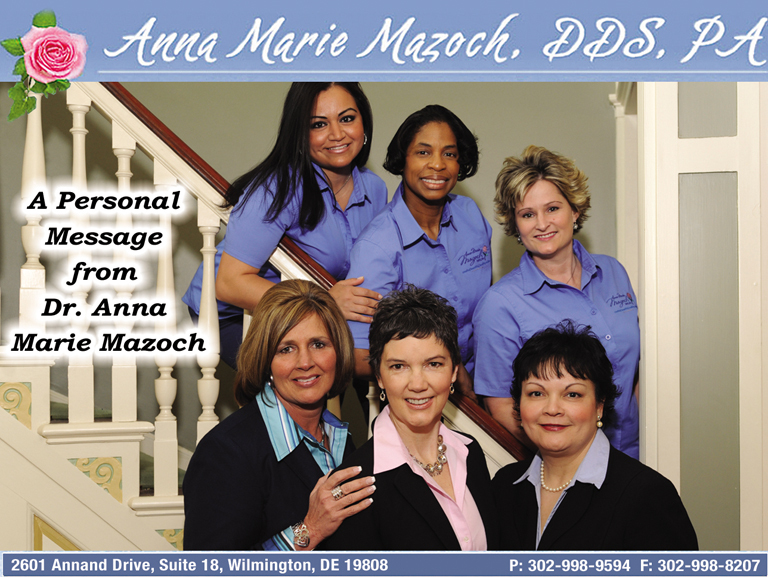 Dr. Mazoch and her staff whitened my teeth too, so that my smile is as bright as can be!” ~ Mrs. E.
“Dr. Mazoch found a lump on the left side of my throat, which I had not noticed at all. I followed up with my Primary Care Physician and that has led to three tests, biopsy and now surgery. No dentist ever gave me a neck/throat cancer check like her. She discovered my problem first. 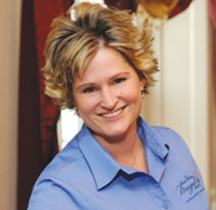 Thank God for that.” ~ Nancy K.
This month, our featured team member is Sherri, our Registered Dental Hygienist. Sherri was born and raised in New Castle County, Delaware. She comes from a large family and has a twelve year old daughter, Anna. Her interests are swimming, reading, going to the beach, taking long walks, and spending time with her family and friends. Sherri attended the University of Delaware from 1989 to 1993 and graduated from Delaware Technical and Community College in 1995 where she earned her Associate’s Degree in dental hygiene. Sherri possesses superb technical skills, providing patients with the most thorough professional cleaning they have ever experienced. She also cares deeply for her patients and truly enjoys her work as a hygienist, especially the bonds that form between herself and her patients. Always eager to further her knowledge in the field of oral and general health, she stays on the frontline of advancements in dental hygiene and takes numerous continuing education courses throughout the year. With her sunny personality and friendly manner, she has succeeded in making each patient feel as though they are a member of our dental family and provides them with top-notch, quality dental care. Make an appointment today for a professional cleaning with Sherri!